Life is good because God is great! This is Elmo and Uniqua attending school! I love it. Allie will start dance tonight so that she can make for real friends bless her heart! Yesterday was so much fun. You know you've have a good day when everyone from the 4 month old to the 30 year old is is covered in glitter and finger paints! I brought the kids to our neighborhood track yesterday to let them ride their bikes and they had a blast. Emily enjoyed our little walk too. She drifted off to sleep in no time amidst the screams of excitement from my other two yahoos! Allie found her a hill to roll down and it reverted me back to my childhood when hard prickly grass was no match for me. And, my little angel has her first loose tooth! I think I am going to glue it back in when it comes out bc she is just not old enough to lose a tooth yet! She also fed Emily bear cereal last night and was such the little mama. She loves her some Emily! Homeschooling is going great. We do academic stuff in the morning, go outside for recess, and come in for art/readiness skills/housekeeping/blocks/you name it to keep their little minds and hands busy! Uniqua and Elmo have joined our kindergarten class for the past few days, but they just stare at me blankly so I don't think they are getting anything from my teaching! I think I have two rebellious rugrats as children! I leave them alone for two minutes and they have covered themselves with "tatoos." Thank goodness they were just star stickers. Lord help me when they are 18! Emily is growing so fast. She is the sweetest little thing that talks all of the time and smiles and coos and cries when I am out of sight. I think she is ready for solids because she literally smacks her lips at our food and tried to dive into my plate of hamburger helper last night. I know msg sodium filled junk known as hamburger helper but every once in a while it is so stinkin good! It is the world's worst blogger once again! So much to say and not enough time to say it so I will make it super short! 1.) We have our precious new bundle. Emily Rebecca Hataway was born on May 9th and is an absolute treasure! She steals my heart just about every day and I could eat her with a spoon! Allie and Joshua love her so much and have adjusted well to our little addition. 3.) Joshua turned three and is 100% boy! That is until Allie dresses him up as Cinderella. I have to say he makes a pretty princess! He is a little goofball. Michael and Joshua have become such good buddies and I love seeing him want to be just like Daddy. Just this morning he took his bible in the room with Michael to "study." I leave you with pictures and hope to post soon! Well, we are still living! I have received many requests for me to start blogging again. So here I am. I can't promise that this will be a lasting thing, but I am sure going to try to keep up with blogging this time! Lots has happened since I blogged last. Allie has started preschool. I cannot believe it. She is my big girl and after a little rough patch the last two weeks of not wanting to go she has bounced right back into loving it. She has learned so much and I am so pleased with her teachers and our whole school experience in general! I have baby #3 on the way. I am so incredibly excited. We were able to see the heartbeat on a sonogram yesterday which eases my mind a great deal. Seeing the little buger on the screen yesterday just made it super real to me. Sometimes I cannot believe that we are doing this all over again, but all in all I think we are ready, and I think our family will be final come May! When I first found out I was expecting I was like "ok I am not eating anything junky and am only gaining 20 pounds this go round." HA HA! I just got done gourging my face with Chinese food. I am starving all of the time and am going to enjoy what is probably my last pregnancy experience!! Well, join me in the future for daily happenings around the Hataway household. Last Thursday was Allie's first day of preschool. I couldn't even bring myself to blog about it. Don't get me wrong. I am so excited for her, and she is absolutely loving it. That is the part that is hard for me I guess. That she loves it. I miss that little girl that didn't want to leave my side for a minute. 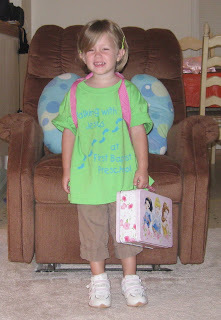 But I am so excited to see her grow up into this big girl who loves her teachers and her new "pestool". Today was easier on me when I dropped her off. It is natural for her and becoming natural for me and I am so happy she is happy! Here are a few pictures from her big day. Joshua trying to take sister's lunchbox! Who are you and what have you done with my little girl! And this my dear friends, is accomplishment. Sadly,so many stay at home mom's do not feel accomplished. They feel like they do not contribute to anyone or anything. However, I have been blessed by an Almighty God not to feel that way. To me, sitting with my two babies in the chair reading a book at the end of a very busy day is the very definition of accomplishment! I am married to the love of my life. It is as if God picked Michael for me. I am a mother to a little girl that surprises me everyday with just how sweet she can be; and to a little boy that already has me like puddy in his hands. I would say that if I could sum up my life in one word, it would be BLESSED! Thank you God for giving me the ability to be a wife and mother! How excellent is thy lovingkindness, O God! Therefore the children of men put their trust under the shadow of thy wings. They shall be abundantly satisfied with the fatness of thy house; and thou shalt make them drink of the river of thy pleasures. For with thee is the fountain of life: in thy light shall we see light.